The first “Atomic Grog Mai-Kai Mixer” on June 9 served up not only a rousing party featuring a cool retro DJ and live vintage surf music, but also an inside look at some of the 55-year-old Polynesian landmark’s acclaimed tropical drinks. Mai-Kai Mixer participants enjoy their cocktail flights and a prize from B.G. Reynolds' Hand-Crafted Exotic Syrups. Surf band Skinny Jimmy & The Stingrays and DJ Mike “Jetsetter” Jones rocked the house all night long as partygoers enjoyed the festive vibe in the Fort Lauderdale restaurant’s elaborately themed Molokai bar. Click here for a full recap of the entertainment, plus photos. But for some, the event’s highlight came during happy hour. Early arrivals were promised “blind tastings” of three vintage cocktails presented by Mai-Kai manager Kern Mattei. There were 32 flights served in the packed bar, with at least 44 tasters participating. Prizes were awarded to those who correctly guessed which exotic drink they were tasting. Priced at just $15 for three 8-ounce drinks, it was a bargain for the lucky participants. In addition, everyone enjoyed the regular early Saturday happy hour featuring half-priced drinks and appetizers from 4:30 to 7 p.m.
Mattei designed the flights based on a theme. He wanted the drinks to be a progression that showed how the blending of multiple rums yields different flavors. To top it off, one of the rums in all three drinks was Lemon Hart, a rich and flavorful Demerara rum that just recently returned to The Mai-Kai after a 15-year absence. 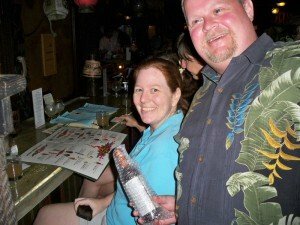 The drinks progressed from a mild drink with two rums to a strong drink with four rums. It was a great concept, and it allowed everyone to get a taste of how Lemon Hart is raising the bar of many of these classic cocktails. It was my first tasting of Lemon Hart in several of these, including one that was a big (though not unexpected) surprise. Our list of Lemon Hart cocktails is now complete, with one still to be reviewed. Click here for the full list. 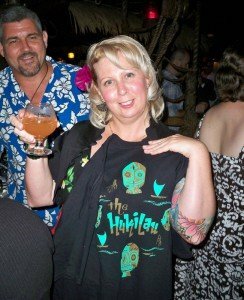 A Hukilau T-shirt is the prize for guessing the name of the drink in the cocktail flight. Of course, the use of multiple rums in cocktails was pioneered by Donn Beach (aka Don the Beachcomber), who invented the the modern tropical drink in the 1930s and raised mixology to an art form. His drinks often contained up to a dozen ingredients, unheard of during that era, and his use of farm-to-table ingredients such as fresh herbs, fruits and homemade syrups is now hailed as being 80 years ahead of its time. Beach’s pièce de résistance was the Zombie, which became his most famous “rum rhapsody” and one of the world’s most popular cocktails. He and his drinks helped spur the entire Tiki and Polynesian Pop movement which peaked in the 1950s and ’60s. That brings us to The Mai-Kai, where a Donn Beach disciple, Mariano Licudine, created the cocktail menu in 1956 based on all the Don the Beachcomber classics, plus some of his own originals. Licudine was a master at taking everything he learned from decades under Beach and making his drinks even more accessible and decadent. The three cocktails offered up by Mattei on June 9 were all from that original 1956 menu and are descendants of Don the Beachcomber. First up was the S.O.S., a drink from the mild menu based on Beach’s Three Dots and a Dash. It contains Lemon Hart and gold Puerto Rican rum, which combine to form a uniquely rich but not-too-powerful kick that doesn’t overshadow the sweet flavors, most notably orange juice. You can also taste lime and a hint of falernum, a tart and spicy West Indies sugar syrup often employed by Beach and featured in many Mai-Kai cocktails. It’s worth noting that Lemon Hart replaced the earthy Martinique rum, which is still mentioned in the drink’s description on the menu, and it’s a welcomed improvement. The menu will be updated soon, Mattei said. Next was the Bora Bora, a lesser-known drink from the strong menu that can be traced back to Don the Beachcomber’s Donga Punch. It also featured Martinique rum, but it now includes Lemon Hart, Kohala Bay dark Jamaican rum, and gold Puerto Rican rum. I knew this would be better than the previous version, but I wasn’t expecting such a vast improvement. Mattei’s flight selection also was designed to show a progression away from the sweeter juices, with the Bora Bora featuring grapefruit juice along with fresh lime juice and bitters to offset the stronger rums. Kohala Bay (aka “Dagger”), which is slightly overproof in the London Dock style of Jamaican rums, is one of The Mai-Kai’s secret weapons. You’ll find it (along with Lemon Hart) in many of the best drinks, especially the strong ones. Click here for more on Kohala Bay and a list of the drinks that feature it. Last but not least was the infamous Jet Pilot, perhaps the strongest drink at The Mai-Kai and a descendant of Donn Beach’s Test Pilot. Featuring four rums (Lemon Hart 151, Kohala Bay, gold Puerto Rican, light Puerto Rican) and just one juice (lime), this drink is indeed designed for the “fast and courageous,” as the menu description says. Our discovery of the exact rums, plus the lack of juices, led us back to the drawing board on our tribute recipe, which you can read about here. The combination of rums and syrups is very similar to another high-octane classic, the 151 Swizzle. The Jet Pilot is probably a bit more spicy and bitter, but in a good way. We detect a hint of anise (probably Pernod) with some honey syrup lurking in the background. And the combination of rums is right out of the Donn Beach playbook. The light and gold rums provide a base for the smoky Lemon Hart and sweet Jamaican rum to dance on top of. This one’s always a fan favorite. After the flights, partygoers also enjoyed the Yeoman’s Grog, which was half-price all night long. This is another Don the Beachcomber descendant (the Navy Grog) featuring Lemon Hart and Kohala Bay, plus light and/or gold rums. Like its classic forefather, the drink gets its unique spicy flavor from a healthy dose of allspice liqueur, and its sweetness from a rich honey mix. All classic Don the Beachcomber ingredients and techniques that have been kept alive for 55 years by The Mai-Kai and just now are being embraced by the craft cocktail movement. Winners who named the correct drinks received prizes from The Hukilau, the Miami Rum Renaissance Festival, and B.G. Reynolds’ Hand-Crafted Syrups. For the winners of the B.G. 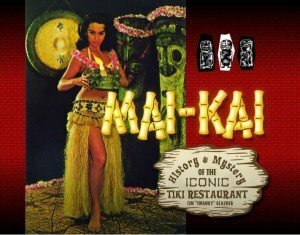 Reynolds syrup, we’ve identified our top 10 Mai-Kai drinks with ancestor or tribute recipes that contain cinnamon syrup. Enjoy. This entry was posted in Cocktail reviews, Cocktails, Cocktails, Culture, Events, Events, History, History, Mai-Kai, Recipes, Rum, South Florida and tagged BG Reynolds, Bora Bora, Cinnamon syrup, Don The Beachcomber, flights, Fort Lauderdale, Jet Pilot, Kern Mattei, Kohala Bay, Lemon Hart, Mai-Kai, Mai-Kai Mixer, Mariano Licudine, Molokai bar, recipe, rum, S.O.S., Yeoman's Grog. Bookmark the permalink. Looks like it was a great event, as I was sure it would be. Congratulations! It’s interesting to see the Bora Bora as a Donga Punch descendent getting reworked at Mai-Kai to now use LH 151 in place of the Martinique rhum agricole the original Donn Beach recipe called for. Interesting, to me, because subbing Demerara for rhum argicole in the Donga Punch is exactly what I do at home when I want to make that drink more accessible to folks who are not entirely enamored with the funky agricole flavors. When I make Donga Punches for myself I’ll go back and forth between Demerara and rhum agricole depending on the mood of the evening.